Barring the usual teenage pranks, all seems peaceful at Philly Prep, the private school in Philadelphia where Amanda Pepper teaches English. No doubt the money that appears to be missing from funds collected to aid victims of a catastrophic hurricane Down South will turn up. Probably the rumor that some of Amanda's students have discovered the thrills of gambling is totally unfounded. In any case, Amanda has other things to think about. Her husband, private investigator C. K. MacKenzie, is struggling to help his Louisiana kinfolk reconstruct their post-hurricane lives. Her friend Sasha's stepmother has just committed suicide--although, according to Sasha, Phoebe Ennis would never have killed herself, especially not while having a drink and wearing a red silk blouse and red sandals with four-inch heels. Amanda isn't persuaded but reluctantly agrees to help investigate the woman's demise, though the evidence for foul play is slim. True, the middle-aged compulsive collector of knickknacks wasn't universally loved. Phoebe's own son hated her and she bored her friends to death with hints of her "royal" lineage. And with four marriages behind her, she was already preparing to announce her renewed availability on the Net. But when another woman is found dead in Phoebe's house, it becomes clear that something is indeed murderously amiss, and much closer to home than Amanda or anyone else could have imagined. 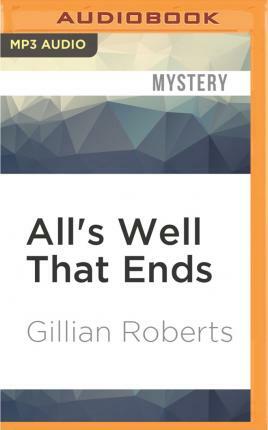 All's Well That Ends is the final book in Gillian Roberts's acclaimed Amanda Pepper series. It's also the best, irresistibly intelligent, and richly entertaining. Amanda's farewell adventure brings the genius of "the Dorothy Parker of mystery writers" (Nancy Pickard) into full flower, and the bloom is sweet and a wonder to behold.